Jim Morrison is a chaotic genius. His songs and poetry are irresistibly electric and passionate. But The Lizard King (a name Morrison adopted for himself from his poem “Celebration of the Lizard King”) isn’t the next Dickinson or Dylan. He isn’t the next anyone, really. Morrison’s style is uniquely undulating and alive as it embodies opposites at once. The desert, at dawn, and a truck load of Indian workers had either hit another car or just – I don't know what happened – but there were Indians scattered all over the highway, bleeding to death. So the car pulls up and stops. That was the first time I tasted fear. I musta been about four... (you know) a child is like a flower, his head is just floating in the breeze, man. The reaction I get now thinking about it, looking back; is that the souls of the ghosts of those dead Indians; maybe one or two of them were just running around freaking out, and just leaped into my soul. And they're still in there. The rest of Jim's family claim this incident never occurred; they saw no Indians, no overturned trucks, felt no spirits. Yet it is held by some as evidence that Jim Morrison was a shaman;that the spirit of one of those dead Indians entered his body on that day, and fed him with spiritual, poetic and musical wisdom. Jim wrote and sang for The Doors, who swirled around him in a blur of John Densmore's cymbal crashes, Ray Manzarek's kinetic keyboard offensives and Robby Krieger's minimalist, apocalyptic guitar solos. His poetry and lyrics do seem to be fueled by some force greater than usual human creativity. Morrison captures the beauty and truth of reality and infuses it with surreal mysticism. This element of the supernatural is what gave him the reputation he still holds today, thirty four years after his death at that mythical age of twenty-seven, as the rock god of shadowy ecstasy. Jim's wife, Patricia Kennealy Morrison, said that Jim was not a static icon, but rather an innovator and that "the thought of being an icon was repellant (to him). He was one of the great iconoclasts of all time, I think he's probably just laugh about his icon status and then set everybody straight in that southern gentleman way I love him." 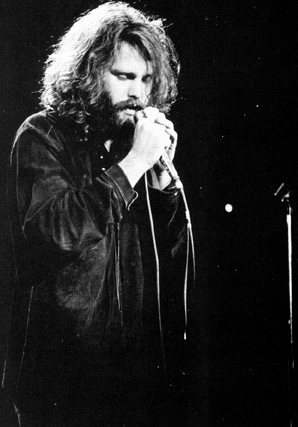 New York Post journalist Al Aronowitz saw Jim perform with The Doors and wrote that it seemed like Jim was acting like a rock star poseur, but upon getting to know him, Aronowitz rescinded his initial judgment, saying "I was delighted he was such a nice, funny and accessible guy compared with the usual rock star aloofness." The world we suggest is of a new wild west. A sensuous evil world. Strange and haunting, the path of the sun, you know? Toward the end, at least for out first album. We're all centered around the end of the zodiac. The Pacific; violence and peace; the way between young and old." And Jim and The Doors did it. They created a seemingly impossible world of love and death, reality and fantasy, poetry and despair. Jim shows us the complicated world we all know and the complicated ways we all are, but from his lips, complication and chaos are comforting. Rakhel Shapiro is a punk rock goddess living in NYC.